GARDEN GROVE, CA JANUARY 10, 2012: Running Raceline Aluminum Beadlock Wheels at this years 2013 King of the Hammers could add $5,000 to the winners pocket at the Ultra4 race on Friday February 8, 2013 in Johnson Valley. “We have always been about supporting our racers, who in turn support us. This is just one more opportunity that we are happy to put towards their success!” said Greg Mulkey, Raceline Offroad Brand Manager. 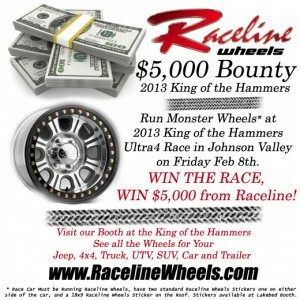 Raceline Wheels has always hosted a dinner for the Volunteers during the King of the Hammers week. “This year is no different, we know that it is a long day for all the volunteers and we appreciate that they are helping, it’s our little way of giving back a ‘Thank you’,” said Greg Mulkey. Dinner will be served on Thursday night at 7pm at the Raceline booth on Besttop Blvd. To qualify for the $5,000 bounty the Ultra4 Race car must be running any Aluminum Beadlock Raceline Wheels including the Monster series. The car must have two standard size Raceline Wheels stickers, one on each side of the car and an 18”x8” Raceline Wheels sticker on the Roof of the car. Stickers will be available at the Raceline Booth all week and at contingency. All the shiny aluminum wheels will also be on display in Vendor Row alongside many other wheels that are common for Jeeps, UTV’s, SUV’s, Trucks and Cars. “This is an event that we look forward to every year,” said Mulkey. “Supporting the racers get to the finish line is only a portion of the week, the fun part for me is getting to meet all the people from across the country that run Raceline Wheels on their trail rigs.” Raceline will be in HammerTown the entire week for any technical questions for rock crawlers, tow rigs, trailers, UTVs and race vehicles. The Outside Display booth is located on Besttop Blvd just across from the main meeting tent. More news will be released soon on the Full Raceline Wheels Team, including Greg Mulkey and Curt Hildebrand racing the Raceline Wheels / TeraFlex Suspension 2012 Jeep Wrangler Sport in the Smittybuilt Every Man Challenge. Two more Raceline Wheels employees, Jason Divis and Greg Wells, will be suiting up to race the Arctic Cat Wildcat 1000 in the HCR King of the Hammers UTV Race. For more information on the Monster Raceline Wheel go to http://racelinewheels.com/c-13-competition-beadlock-series.aspx or Contact Greg Mulkey or Mike Dickerson at 800-529-4335. Join our Facebook page for the most current Raceline Wheels information and to see vehicles sporting the Raceline Brand www.facebook.com/racelinewheels. Founded in 1996, Raceline Wheels® are competition proven wheels with multiple championships in many different racing disciplines. Raceline Wheels® has had great success transferring this knowledge from racing to the street, bringing the same high quality products to a full line of wheels for everyday vehicles. Headquartered in Garden Grove, California (Orange County), Raceline Wheels® is a wheel industry leader in performance, craftsmanship, engineering and innovation. Owned by Allied wheel Components, Inc., Raceline Wheels® distributes its products through an independent distributor system in the United States and through international distributors in more than 30 countries. For more information on Raceline Wheels®, log onto www.racelinewheels.com.